2018 has been an eventful year. We’ve graduated a new batch of teachers with expertise in Special Education in an Inclusive Setting. Over 165 government school students attended a writing program and authored handwritten books. 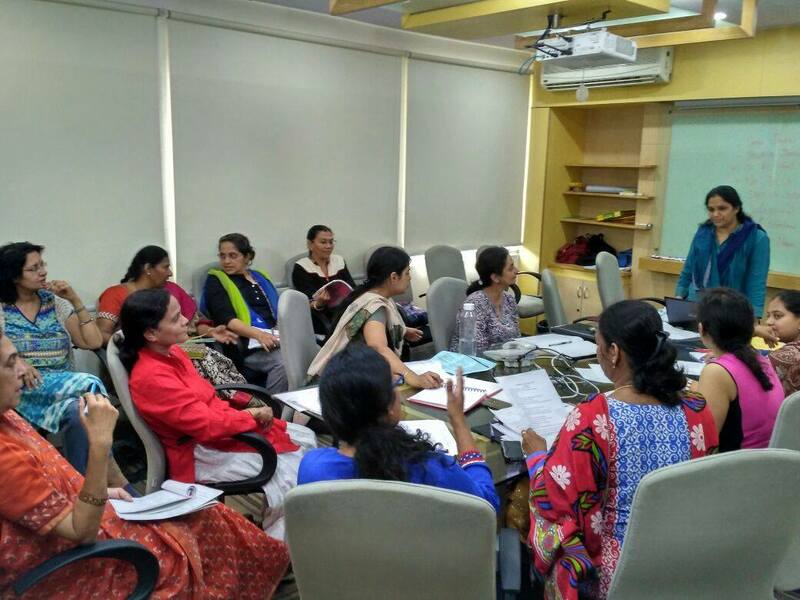 Several professional development workshops were offered by Samam Vidya, and over 150 teachers participated. 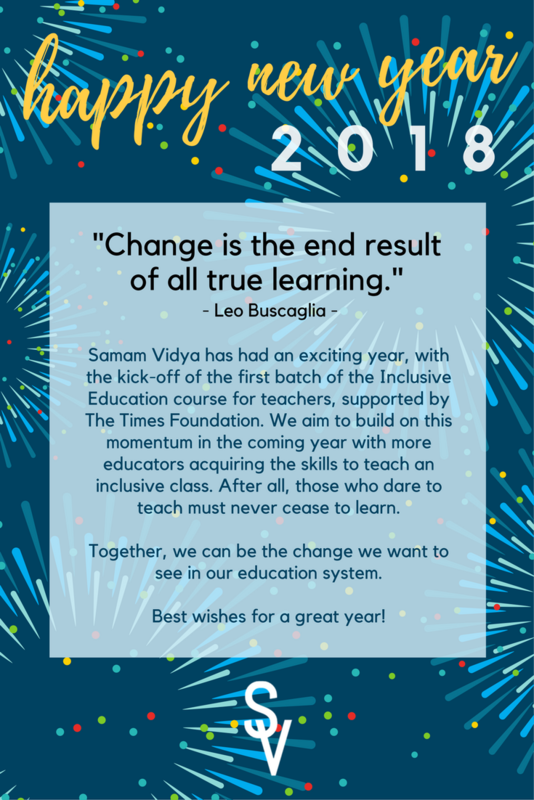 In the new year, Samam Vidya calls on all thoughtful, committed people to work on furthering the cause of inclusive education. We will know that inclusive education has become embedded in our culture when the term becomes obsolete. Best wishes for a Happy New Year 2019! A learning disability is a neurological disorder. Some brains are wired differently and such students learn differently. Such students may have trouble learning through the traditional teaching methods. There is no correlation between having a learning disability and IQ levels. Students with LD can be found anywhere on the IQ bell curve. Famous successful artists have admitted to struggling with LD as students. On the other hand, LD is also frequently found as a comorbidity with other conditions such as Down’s, autism or physical disabilities. LD is the single largest group of students among all disabilities. Fully half of all disabilities is LD. This is a huge section of our population. Neglecting to nurture the potential of such students is a disservice to the students and to our country. As previously mentioned, students with LD can be found everywhere on the IQ graph, which means that there are several bright students with LD who are dropping out of our sphere of influence due to our (the system’s) apathy. Such bright students, if properly supported by our education system, would be successful contributing members of society. 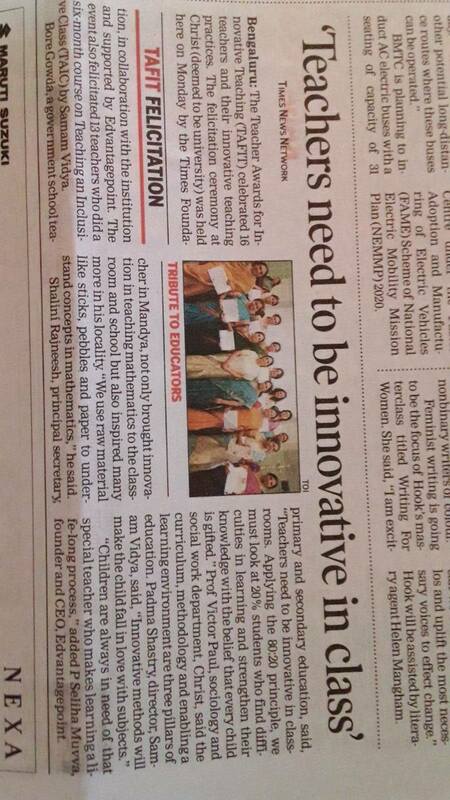 It is commendable that boards are now open to supporting such students by making education inclusive. Schools should be a microcosm of the society we live in. All students should learn to coexist comfortably with each other. This can only happen when all children are exposed to children different from themselves in some way from a young age. Education is truly inclusive when children from all socio-economic groups, religions, genders, sexual orientations or abilities study together. All children benefit from inclusive education by learning to accept differences in a matter-of-fact way, and becoming comfortable in their company. Children with LD definitely benefit from an inclusive education because they have the potential to succeed with support. Willfully releasing thousands of such students from our sphere of influence prematurely (giving up on them) is a dangerous social disaster. We don’t want ill-educated children with no skills, but with enough intelligence to get into trouble, to grow into under-employed and bitter adults. It has been proved by studies that supporting students with LD to stay in school will lead to a lower petty crime rate. Most of the concessions are focused on visual impairment and other visible disabilities. The following seem applicable to students with LD. General guidelines for deciding concessions – it should be highly INDIVIDUALIZED. Not every student needs everything that’s offered. Every student should be given what s/he NEEDS. That’s the only way equity can work in an inclusive class. A parent of a typically developing child feels it’s unjust for one child to get a copy of the class notes, and not her own son/daughter. So concessions will only work when the principle of equity is uniformly enforced – EVERY child gets what s/he NEEDS, including typically developing students. Arbitrary capricious heavy handed giving of concessions dilutes the spirit of offering APPROPRIATE help. The same big hammer cannot be employed for every nail. Fears about giving concessions – All concessions have to be weaned slowly over time. (But not all concessions can be removed entirely. Some students will need some concessions all through life.) But as students, they need concessions on a regular basis to succeed, and they need to get used to succeeding. (Their self-esteem will already be low from chronic failure over time). The same concessions cannot be given throughout the entire school career. Some will be removed, others will be added. Concessions are not supposed to be a lifetime free pass. This fear is because the Indian education system has not defined a clear final goal of a school education. One of the goals is INDEPENDENCE. Whatever we do for students has to move them towards this goal. Hence we wouldn’t be very good educators if we sent out a student into the world saddled with a meaningless concession. It behooves us to make the student as independent as possible, empowered with meaningful concessions. http://www.smartkidswithld.org/getting-help/the-abcs-of-ieps/examples-of-accommodations-modifications/ I can assure you this is only a partial list of possible accommodations and modifications. Accommodations and modifications are decided by the special educator to suit the situation at hand. Scribe – Not all students with LD need a scribe. In fact, I don’t remember assigning a scribe to even one student with LD over my career, and I’ve had many many students with LD. A scribe is given if there is a chronic fine motor issue, or an extremely ADHD/ADD situation (even this is very rare. We use several other strategies to avoid using a scribe.) I did assign a scribe to one visually impaired student. I assigned a scribe based on need for a scribe, not based on the name of the disability. A fine motor disability can be seen in many students for many reasons, maybe Down’s, maybe autism, maybe physical disability, maybe CP, etc. So there has to be a solid reason to assign a scribe; the decision is not made based on the name of the disability. Compensatory time – Again, not a good blanket concession. First, it has to be determined whether students are actually using the regular time given to them. Are they actually using the entire 2 hour exam period, are they fully engaged the whole time? If they are, and they are not able to finish the exam despite their good faith efforts, THEN extra time is called for. The special educator needs to establish a history of past testing behavior before deciding if extra time is warranted. Counterpoint – it is downright cruel to lock an ADHD child for an extra hour in his/her seat in the name of giving extra time. A better solution would be to give the test in short 15 min/half hour bursts, in as many sessions as required to finish it. The right attention span would only be determined after classroom observation by the special educator. Such a concession would be slowly weaned off, increasing testing time increments gradually, and POSSIBLY ELIMINATING the need for extra time by the time board exams roll around. 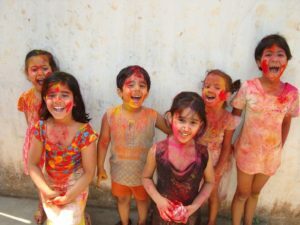 Exemption from 3rd language – Very good concession. It is an excellent idea to reduce the academic load on struggling students, as they are using significant mental bandwidth to manage their LD. Flexibility in choosing subjects – excellent concession. For the same above reasons. Also, students typically do better in their subjects of choice. When they have a strong purpose to learn (interest), they put in more effort. My problem is with the medical certificate for LD. LD is not a medical condition. It’s not diagnosed, it’s identified. It’s not a blood test or MRI test. It is the purview of educators. Apart from a psychologist administering an IQ test, there’s no place for a medical input, unless there’s a comorbid medical condition. (Even then the LD itself should be off limit to doctors). Resource rooms – Invaluable. I don’t mean a room where special ed kids go for instruction (this too, but this is not its primary purpose). This is NOT a sneaky way to segregate education within inclusion. ‘Special education is a service, not a room’. A resource room is just that – a room with valuable resources. It would be a room where low tech assistive technology, alternate curriculum, and high tech assistive technology would be kept for use by all teachers as needed. It would include space for quiet or separate testing if necessary. It would also serve as a quiet room for overstimulated students to decompress, when they feel overwhelmed. A lot more can be said about this. Special educator – An invaluable member of the child’s IEP team. Special educators come with a knowledge base both broad and deep, and would be the case managers of students with special needs. A ratio of about 30 students to a teacher is manageable. Alternate curriculum – if a child could learn at the same pace, and with the same methodology, as all students, then we wouldn’t be having this discussion. Schools need to relax and let go in order to accommodate the use of TLM that suits the needs of different students. Alternate testing – same point as above… students with LD don’t test well. Assessing knowledge is not the same as scoring well on a test. So teachers need to consciously assess knowledge in the modality that works for the student. Content knowledge of teachers – A content knowledge test for teachers before entering a B.Ed or D.Ed programs would ensure that all teachers have deep knowledge of the content that they would teach. They should also teach only in their area of expertise. Ancillary service providers – if inclusion is to happen, then schools need to have SLPs (speech Language Pathologists), OTs, PTs, lip reading teachers, braille teachers, sign language teachers, educational psychologists, behavior specialists, etc. If a child can’t use braille, but is sitting in a mainstream class with a teacher with no training, optimal learning cannot happen. It’s just a stressful situation all around. If, in addition, this is a frustrated child with anger issues, it will lead to a very sad classroom management problem. How would a school provide so many services? Well, these professionals wouldn’t be full time employees of the school, rather, contractors who visit on a regular schedule if there are such students at the campus. Do you have any thoughts on grading methods is equitable for children with learning disabilities in an inclusive setting? Wow! Big question, and a hot button issue! Equity in grading… if a student tries and continues to fail, it won’t be long before the student stops trying. This is common sense. So how does one motivate while acknowledging that quality of content is not up to par? Effort grades can be helpful in helping to motivate a student to try harder. The content (subject) teacher then assigns content grades on the same scale as the whole class. The student’s grade is then the average of the 2 parts. This is a direct lesson in how hard work can help them raise their grades. Over time, students do improve in their content knowledge. It goes without saying, alternate testing and testing accommodations should already be in place. Grading apart, the tests themselves need to get inclusive. If a student struggles with reading, and fails a Math test with word problems, did he fail Math or did he fail reading? Did we measure his content knowledge (Math), or did we measure his weakest link (reading)? Tests have to be rigorously constructed to measure content knowledge by bypassing the weakest link. This is a very difficult trick, and the reason to train teachers, and hire a special educator at every school. Board exams need to adhere to this rigorous standard as well. Finally, for inclusive education, schools have to get inclusive, boards have to get inclusive, text books and other TLM have to get inclusive, teachers, attitudes, testing, grading, infrastructure, training, doctors and other service providers, ayahs, bus drivers and other support staff have to get inclusive, and last but not the least, other students, parents and society have to get inclusive. Work has to happen in all these areas. Teachers sometimes might feel apathetic about their jobs. It’s hard to be motivated and care when one feels that their efforts are not making a difference. That’s the trouble with focusing on teaching content. Students hold content in short-term memory until their next test. After that is done, the content is forgotten, unless it is used regularly in their area of interest. Students interested in robotics, for example, might remember and use all the Physics and Math they learned. The rest of the students forget it all pretty quickly. Most of us have forgotten most of the content we learned in school. I don’t remember calculus, the order of the halogens, and the breakdown of kingdom, phylum, family or whatever the taxonomical divisions of biology are. I don’t use them on an everyday basis, after all. I also don’t remember the names of the characters in all the novels I have read. What I do remember, though, are the analyses and syntheses we had to do about the themes in the books. I also recall learning about the different psychological theories of Piaget, Maslow and others. While I don’t remember many of the details, I do remember how I applied them in my work with students. Content vanishes. When teachers spend the bulk of school time on teaching an unvalued asset, it can start to feel like the work doesn’t matter. I feel the same way about housework. I wash breakfast dishes, soon I have to wash lunch dishes. Then dinner dishes. I start all over again the next day. The sink is never clean, and I feel like Sisyphus rolling the boulder up the hill every single day. I never seem to make progress. And so it is with teaching content knowledge. What we should be focusing on instead is process. Process is a transferable skill, and it sticks. Students actually make progress and progress to the next level. Then further, and more complex skills can be taught. It is the substance of education, and very satisfying. Content is cheap. It is ubiquitous and easily available. Books, libraries, the internet- sources of content knowledge are everywhere. What is not so easily available, and hence is so valuable, is process knowledge. How do I use what I know? What do I do with all the data I possess? How do I use my content knowledge to my advantage? How do I convey the information I own to my clients? Out of all this information, what is important and relevant to me? What new information do I need to further my strength in an area? Which source of information will suit my needs best? The big over-arching question that process encompasses is- What do I do with all the content knowledge I learned in school? How do I use it? How is it relevant to me? Teachers can identify with this conundrum. The teaching methodology course teaches all the details about Bloom’s Taxonomy and Gardner’s multiple intelligences, etc. Yet, how many teachers can remember the skill levels in Bloom’s Taxonomy? How many can remember the various intelligences listed by Gardner? Yet every teacher knows what to do when he or she enters the classroom. All that foundational content knowledge serves to help the process of teaching. Teachers will feel a greater sense of purpose in their jobs when they focus on process, rather than purely on content. Focusing on content alone feels like running on a treadmill, and both teacher and student quickly lose interest. Focusing on process will actually give teachers the traction needed to move learning forward. What teachers need to be teaching is higher order abstract meta-cognitive skills. 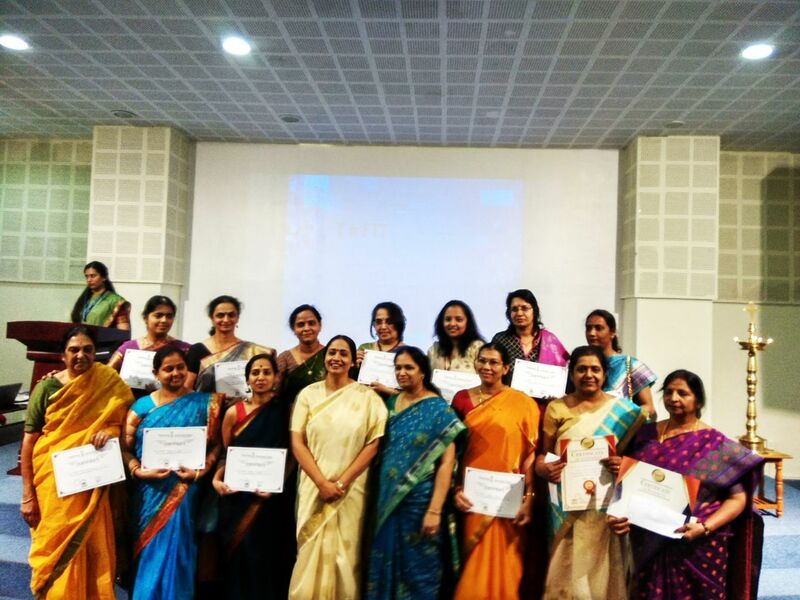 Samam Vidya is very proud to present the first graduating class of the ‘Teaching an Inclusive Class’ course. We are very proud of the hard work put in by all the student teachers. We are also very thankful for the support of the Times Foundation in making this course a reality, putting the word out there through their newspaper, and granting us the space to conduct classes. We hope to continue the collaboration with future batches of teachers. Here are a few vignettes of our group at work. Students learned how to apply the principles of inclusion in their classes, in various subject areas. It was a heavily activity based course, and they applied these methods in their own classes with their own students. The principles of inclusion that they learned were applied across grade levels, from preschool to college, and across subject areas, from Math to theater arts. The strong collegiate relationships formed among this group will ensure that they will always be a resource for each other over their careers. Like and watch this page for announcements of upcoming programs. We wish a happy, happy new year to all our friends and supporters! 2017 was a big year, and we can’t wait for the progress and projects that await us in 2018. How many of us remember the atomic number of Oxygen? Who can name all the halogen gasses? When did the first Panipat battle occur? What is the formula for calculating the volume of a cone? What is the difference between ‘its’ and ‘it’s’? We all sat in Science, Social Studies, Math and Language classes all through school. Yet today as adults, we can’t recall much of what we learned in school. What then did we learn in school? In today’s world, knowledge is free. Or almost free. Basic web searches can give us facts about virtually anything we want to know. Any of the questions above can be answered by ‘googling’ on one’s smartphone in a matter of seconds. If the only thing teachers teach is factual knowledge, then all that effort will have been in vain. Students will barely remember any of it- at most till their next exam. While factual knowledge is necessary to pass exams, it can’t be the only reason for kids to attend school, especially since all that knowledge will be forgotten in short order. Forgotten in all the exam fever and tension about completing the syllabus is learning that endures. This is the learning that endures beyond school. What remains of Science class after all the periodic tables and chemical equations are forgotten? What remains of History class after all the dates and dynasties are forgotten? What remains of geography class after all the rivers and mountain peaks are forgotten? What remains of Math class after all the quadratic roots and volume formulae are forgotten? If the answer is that nothing remains, it’ll have been a wasted educational career for both student and teacher. If a Science education does not create a scientific temper in students, if a humanities education doesn’t impart a strong critical reasoning faculty, if a decade of Math education doesn’t provide a strong foundation for applied skills, what then is the usefulness of such an ‘education’? College bound students definitely need all the factual learning. It is the springboard to college and career. Any student capable of college is also somewhat capable of self-taught ambient learning (learning that endures). But not every student goes to college; there are several students for whom factual learning is merely incidental, and who would benefit from some ‘real’ learning. So what is the difference between academic schooling and learning that endures? “When we do attempt to measure learning, the results are not pretty. US researchers found that a third of American undergraduates demonstrated no significant improvement in learning over their four-year degree programs.” (http://www.businessinsider.com/universities-should-ban-powerpoint-it-makes-students-stupid-and-professors-boring-2015-6?IR=T) This clearly implies that whatever is being taught in the classroom is not necessarily ‘learning’; and I agree. Our education system needs to focus on learning that endures in addition to short term exam skills in order to create a useful and relevant education for the next generation. 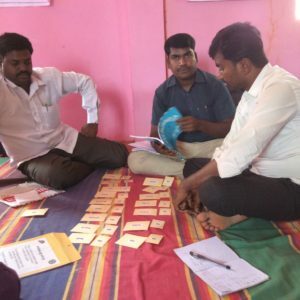 On November 18, Samam Vidya revisited Chamarajanagar, outside Mysore, Karnataka for the second workshop in our series: showing them some ideas on how to teach a class that includes students with disabilities. We got to work with the same teachers as last time, when we taught them how to recognize learning and developmental disabilities in the classroom. 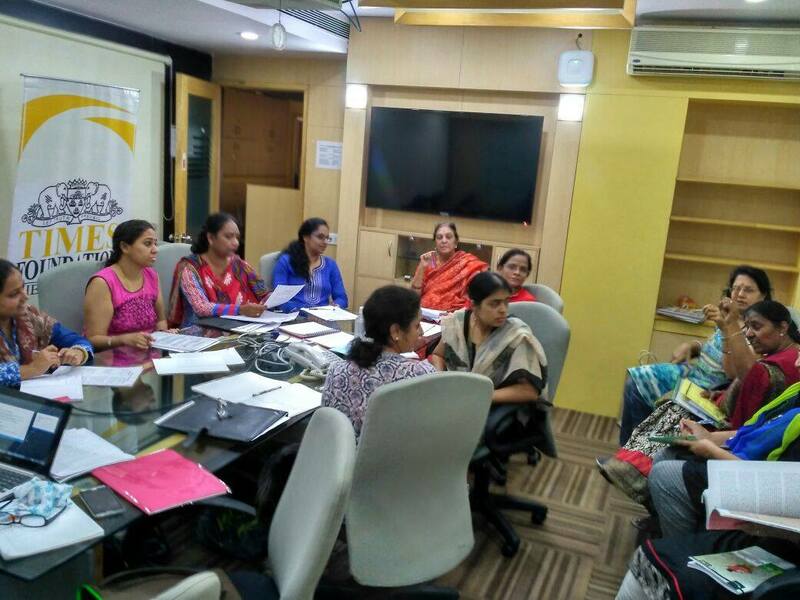 It was a great group of teachers organized by Mobility India, and we enjoyed very much working with them. Teachers play a grammar game during the workshop. We did a series of activities that teachers can employ in the classroom that can be used for students of all learning levels in the classroom. Teachers learned how to use the visualization technique to assess comprehension in students. They also learned how to use groups to maximize participation and learning. Teachers learned a few remedial as well as enrichment techniques. We also did an activity-based science lesson that involved station teaching. We also used grammar games to make the grammar lesson more fun. All the teachers we worked with were game for this and had so much fun with all the classroom activities! 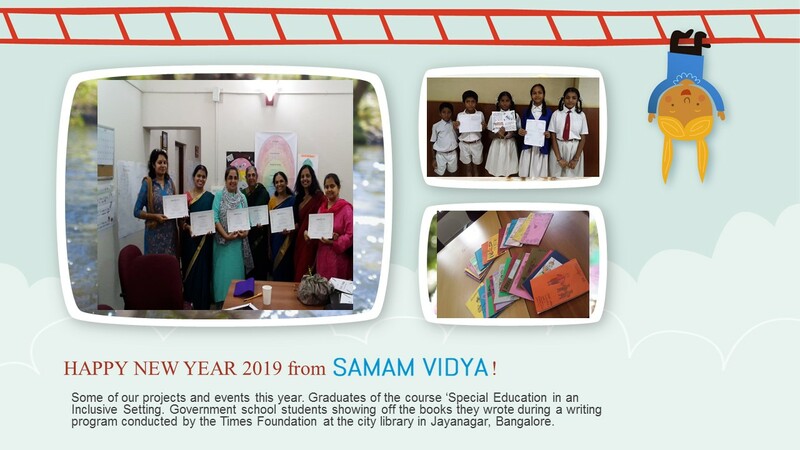 Samam Vidya looks forward to working further with these teachers. If you and your school would like to have as much fun teaching kids as we do, please reach out to us at info@samamvidya.com or at 77600 21966 to schedule your workshop today! 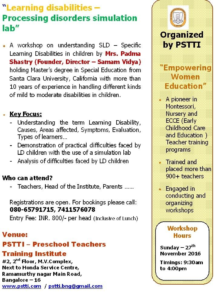 Padma Shastry of Samam Vidya will be conducting a simulation lab workshop about invisible learning and processing disabilities at PSTTI on Sunday, Nov. 27th in Bangalore. Call them now to reserve your space! LifeDream is 90 day spoken English, computers and lifeskill program,and it will be starting a new batch on September 15th, 2016 in Koramangala in association with Samam Vidya. The target student is a low-income student or school dropout (minimum education is 8th standard, and students average 18 to 30 years). This is a FREE course with 100 percent job placement following course completion. If you know any school dropouts, please convince him or her to join our 90 day boot camp. Spread the word! There are hundreds of them, and let’s get as many of them back on the track to education as possible! 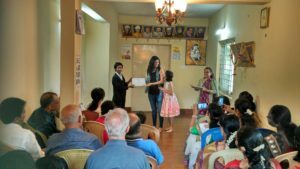 A LifeDream student accepts her certificate of completion. We hope to help many more students like her! This will be held at Samam Vidya’s premises in Koramangala, 3rd Block. This is a very effective and useful program, teaching practical skills that students need to hold a job and live a good life. For enrollment details, please contact Safina at +919986261577 or email lifedream.course@gmail.com.